Whether within the retail sector or for a private function, high quality graphics will attract attention and help create interest. 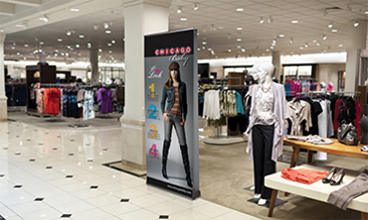 If the need is to generate extra sales or to convey a particular message, there is a display option that will be suitable to meet your requirements. Portable display systems have become increasingly popular as they are easy to set-up and use and are a cost effective way of creating a high visual impact. 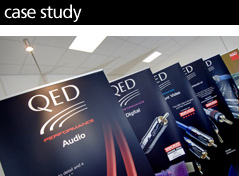 We specialise in two types – Rolla Banners and Exhibition Stands. 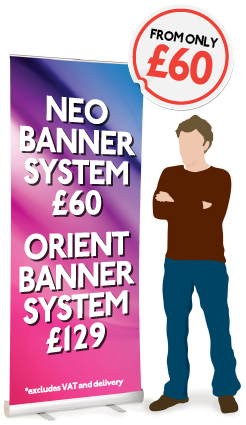 Rolla Banners are light and robust and come in a range of sizes. The graphics for Rolla systems are printed onto a fully tear proof polymeric photobase material and sealed with a scratch resistant overlaminate. This results in a durable graphic that stands up to handling, rolling and transportation. 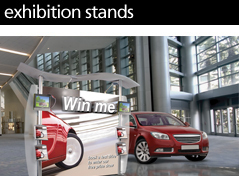 If you are looking for something bigger then our exhibition stands are just the thing. 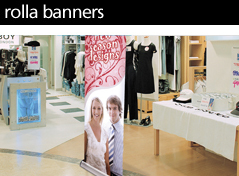 Just like the Rolla Banners, these Pop Up systems are easy to transport and set-up. They are available in a range of different specifications including straight or curved systems. We can also produce replacement graphics for your existing frame. To ensure your project runs smoothly download our artwork setup assistants for digital displays, large format and digital printing click here.